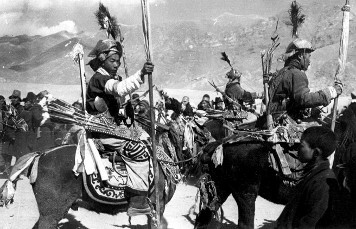 In the Spring of 1942, when the war looked grimmer day by day to the Allies, and the Burma Road was lost, I was given the assignment of crossing Tibet from India to China. The venture, which was primarily to discover ways and routes of transporting supplies to China, was under the auspices of the Office of Strategic Services. Given the choice of going alone or taking along a unit of personally picked men, I selected as my companion Capt. Brooke Dolan, who was then anchored to an Army Air Forces desk in Washington and was casting an eager eye around for overseas duty. The mission, I felt, would have a better chance of success if shared by two men. If one was lost, the other might get through. Captain Dolan (left) and Count Tolstoy inspect their equipment before undertaking their perilous equestrian journey from India, across the Himalayas into Tibet, and on to China. Since Tibet proper is closed to all visitors, no permits to enter could be obtained in the United States. The best passport available for the trip was a letter from President Roosevelt to the Dalai Lama of Tibet. This we were to carry, together with the customary gifts to His Holiness and other officials in Lhasa. On our departure from Washington by air in July, Col. (later Major General) "Wild Bill" Donovan, Director of OSS, bade us "Keep in touch if you can"— a hard task since radio equipment compact enough to carry on such a trip was not procurable at the time. We carried 290 pounds of equipment, including vital instruments, cameras, film, etc., and 27 pounds each of personal belongings. In those days before the Air Transport Command was fully developed, bucket seats on planes were luxuries, and we slept on some of our cargo. Arriving in Delhi, we reported to Lt. Gen. (now General) Joseph W. Stilwell, who was then China-Burma-India Theater commander. His rear echelon headquarters occupied only one wing of the Imperial Hotel in New Delhi, though it was the nucleus of the CBI forces. In our negotiations with the Tibetans through the British Government offices in India, we were aided by Col. (later Brig. Gen.) Russell A. Osmun, USA; Capt. (later Lt. Col.) Charles Suydam Cutting, AUS, an ardent student of Tibet who had been to Lhasa twice in previous years; and George R. Merrill, Secretary of the U. S. Mission at New Delhi. The success of the negotiations was due in part also to the warm support and assistance of O. K. Caroe, Secretary of External Affairs of the Government of India; Sir Basil John Gould, Political Officer for Sikkim and British Representative for Bhutan and Tibet; and Frank Ludlow, Additional British Political Officer for the same region, who at the time was already in Lhasa. 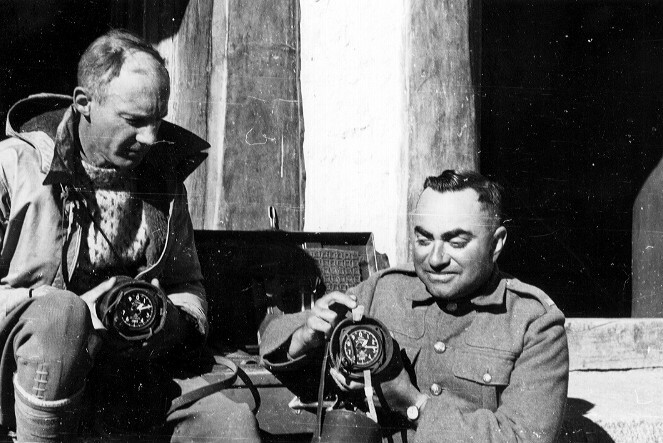 While arrangements with Lhasa were under way by British wireless, Brooke and I prepared for the trip. India was in turmoil. There was rioting in the streets of Delhi, and the city was declared out of bounds. Finally, however, we were given a jeep with permission to go wherever we wished, and we darted around old and New Delhi, obtaining all needed supplies and equipment with the exception of a compact radio receiving set. At the end of September, 1942, we were granted permission to proceed as far as Lhasa. Our prospects of going on from Lhasa to China looked exceedingly doubtful.